Nevron’s GDI+ graphics engine provides the 2D scene with state-of-the-art image quality and legibility, and also conforms to Windows standards for 2D graphics rendering. Image effects such as shadow, glow, bevel/emboss and lighting make it possible to apply complex visual styles to any 2D scene. Bar series provide the capability to display discrete data ranges with marked delimitation between data points. Multiple bar series with vertical or horizontal orientation may be combined using stacked bars, clustered bars, or arranged in different depths in order to provide full data visibility and legibility. Cluster bar charts allow visual comparison between corresponding values of synchronized data ranges. Stacked bar series provide the capability to present data in cumulative sections and their totals. XYZ rendering of stacking and clustering. 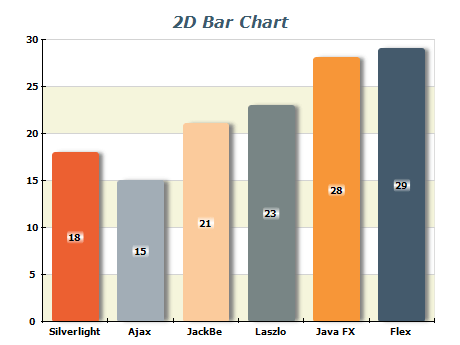 Use Multiseries in a 3D scene to create Manhattan Bar charts, perfect to compare different items over a period of time and to effectively display changes from one category to another. Horizontal orientation of the bars is required by many real-life scenarios. This particular sample demonstrates the use of horizontal bar series in multiple charts positioned within the same scene as an alternative to the Clustered bar series. Clustering and stacking may be combined into the same chart. In a 3D scene, clustered and stacked series may be distributed in different depths. Stacked-percent bar series represent the contribution of data series to the total.